When you go on holiday you need to make sure that you pack the essentials. Yes, you can buy items when you get there if you have forgotten something but it’s always good to make sure you have products from brands you know and trust especially if you have sensitive skin or are prone to reacting to toiletries. I love to make sure I am well prepared before I go away and normally write a list from at least a few weeks before just to make sure that I don’t forget anything as this can be added to easily as time passes and I remember a new item I have missed. Organisation is of course the key to ensuring none of our favourite products are forgotten. I know many hotels will already provide toiletries in the bathrooms such as shampoos, conditioners, soaps and body washes etc. but those provided are not always to the quality I like to use and taking good products with scents I like that will look after my skin and hair really is important. The fragrances of some of these can trigger off lovely memories once the tan (that I always try to avoid getting) has faded and the years pass. My favourite items this year comprise of some gorgeous scented products from a range of companies including Palmers, Vosene Kids, Philip Kingsley and more. Now once we get in from the pool, beach etc. we need to shower and wash our hair and what better to use than my new found favourite scented product from Vosene Kids – Caring Hair & Body Wash with Coconut Oil & Mango Essence. Don’t let the kids part fool you it’s suitable for adults too as hubby and I have demonstrated over and over and over and over until I have to get more stock in (I like to buy in bulk!). Anyway I recently discovered a hair and body wash from Vosene Kids with coconut oil and mango essence that smells divine and really does make washing oneself a fabulous tropical experience even in our daily mundane lives or in my version slightly insane. This can be used on the body and the hair and is so gentle that you can use it to wash hair daily if needed. Your hair will be exposed to the sun which will dry out the hair. Swimming pool water and the sea will also work with this to dry and weaken the hair. A good conditioner is important to help add moisture and nourish. I love the Philip Kinsgsley Re-Moisturising Conditioner for this. I think this works well after the Vosene Kids product to add that bit more moisture and strengthen the hair before you go back out into the sun, sea and sand the next day. It isn’t a large tube so it’s perfect as it won’t weight down the suitcase. It also leaves the hair less frizz which means it will cut straightening time if you plan to do this after. As long as you get one with a high aloe content that isn’t full of other rubbish you should be fine. This is great for soothing sunburn, rashes and insect bites so perfect for taking on holiday and using as an after sun before applying cream or oil. Make sure you let this soak in / dry before applying anything else. If you have a fridge in your room keep it in there it’s so much nicer applied straight from the fridge especially if you have a bite or burn. Palmer’s Coconut Cream & Palmer’s Coconut Oil are great products and their aromas are lovely and can be quite addictive. They will keep your memories of holidays alive even when you apply them in the winter making the colder months that bit more bearable. These can also remove makeup which makes them a great multipurpose product to have with you. They are also great at keeping skin silky soft and of course adding moisture so perfect to use after applying the aloe to the skin. Are there any washes, shampoos, conditioners, creams or lotions that you love to take with you when you travel to a hot country? They sure are great products we love them! A great selection – make me feel like booking a holiday abroad! Sounds like a great idea. Have a lovely holiday. Same here I always take a good conditioner to help add moisture and nourish my hair. 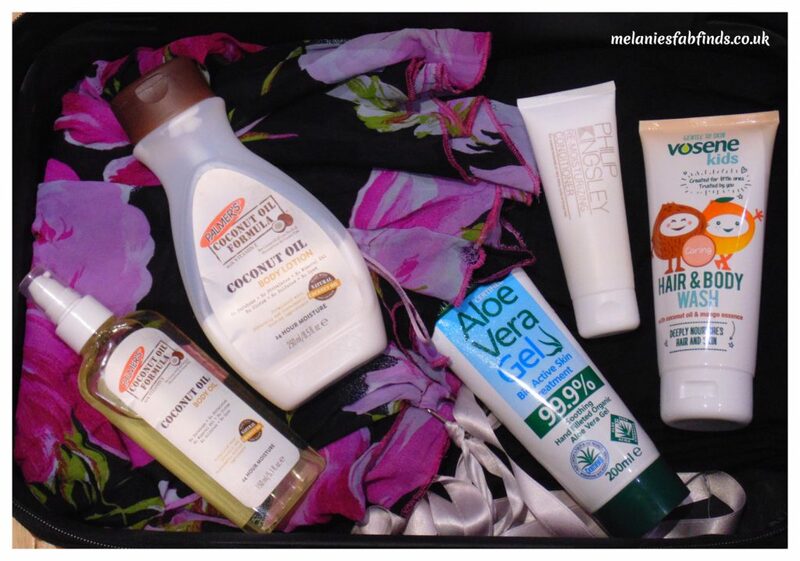 Aloe Vera products are always in my suitcase – my skin drinks them up after a day in the sun. They are always great to have on travels. This sounds like a great list of products, you’ve reminded me I really should get myself some aloe vera gel! Glad you found this useful. Have a lovely holiday. It’s cooling for burns and also great for skin healing too. The vosene kids sounds like it will smell incredible – I didn’t even know they had a kids range! I totally agree that taking away shampoos etc is necessary – there’s nothing worse than a hotel shampoo that dries out your hair! Unless they’re brands I’m familiar with I tend to stay away. I don’t use hotel shampoos they generally aren’t any good. I love all the Palmer’s products. They smell amazing and keep my skin really soft. They sure do smell great! TH palmers products are great post holiday I find to keep your tan going that bit longer! They do help to keep skin moisturised and delay peeling. I love Palmers Coconut oil. I’ve never tried any of the Vosene kids range though, I’ll be looking for it on my next shopping trip. Vosene Kids do have a great range of products we use them loads here. I love anything with coconut! Makes my skin so bright and smooth! It is great fir the skin and also smells amazing! The plants are great, you can just cut off part of a leaf as you need it. Among all of these items, my favorite is the Aloe Vera gel, my savior when I get some burns in a travel. It does come in super handy when you get burnt. I do love it too. My hair is so dry. So I need a new conditioner for my hair. This one is lovely and really does leave the hair looking and feeling great. These are all tried and tested. I love them all. Glad you think that way I also feel it is very important. So many great products. I love anything coconut. They do smell gorgeous and that’s just one reason I love them. I am a huge fan of Palmers products. They smell amazing but I find they are one of the few brands that don’t irritate my skin. Vosene is good and you always need a bit of Aloe Vera gel for the mishaps!